Video assessment activities are often a new experience for many students, so we recommend spending additional time in the planning/preparation phase. The key goal is to allow students the ability to familiarise themselves with the process, and to attempt the process in a safe environment, ahead of time. Such an approach will minimise student (and staff) distress that would otherwise occur, were they to attempt video submission for the first time just before the deadline. Create your own course introduction video using software that is freely available and recommendable to students, so that you can better understand the challenges early on that students will need to overcome. This will enable you to write instructions for students that meet their needs. Set up an activity for students to submit a test video to ahead of time, such as a simple 2 minute self introduction in the first week of semester. Students will be able to test out the full process from their preferred device/location, with plenty of time to determine whether that meets their needs, prior to the assessment task. Remind students that they can use UNSW's high speed internet connection and computing facilities when it comes time to submit their assessment, to minimise issues associated with personal equipment or home internet connectivity. Potential Issue 1: Students occasionally create videos using an unusual video file type or non-standard resolution. This can occasionally lead to videos being frozen during processing. Potential Issue 2: Students occasionally upload very high quality and large video files to theBox. This can take a very long time to upload, depending on their internet connection upload speed, and can cause the web browser to time out and the upload fail. Even if the upload is successful, theBox then has to process the quality down to a web-optimised size for viewers to have a good experience. This means the advantages of uploading a high quality video is lost, but also means the processing will take longer than normal. The free and open-source Handbrake software, available on Windows and Mac, can be used by staff and students to convert videos to a web-optimised standard. This is invaluable as it reduces the likelihood of technical failure and can significantly reduce the time required to upload and process a video file. Once installed, using Handbrake is quite straightforward. 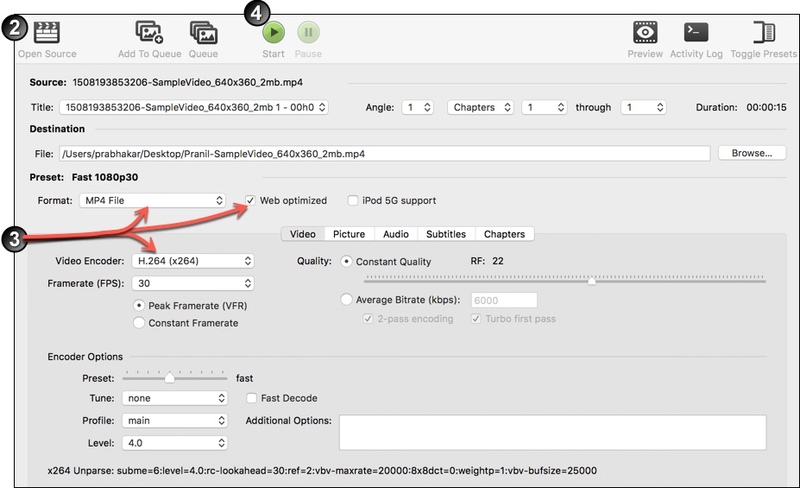 As the software opens, it will automatically ask you to select a source video file. Select the video file you wish to convert and click Open. Video encoder - Ensure this is H.264 (x264). The file that is then created should be optimised and ready for upload to theBox. Don't name assignment collections Assignment 1, Assignment 2, etc. This will make it difficult to identify in the future. Add course codes and term codes to identify which course the assignment belongs to.